My sister and I are tight. Tight enough for our husbands to sometimes wonder where they fall in the ranking. 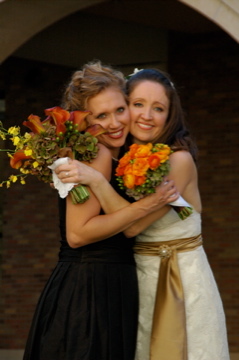 We often reassure them that there is room enough in our hearts for both sisters AND husbands. But I don’t think I realized how naturally we come by that relationship until these last few weeks. When Uncle John had his stroke it did not take long to figure out just how serious it was. Mom was on a plane within about 24 hours to be with her sister. And through that experience, I have realized just how fierce a love between sisters can be. They got into a rhythm of existence that worked for the circumstances. As Dot thought of things that needed to be done, Mom made lists of those needs. When people brought food, Mom made sure it was food Dot liked. When too many people came to visit, Mom was the “meany” that tried to graciously give them the boot. For these last few weeks, it seems like they have been in sync. At all costs, Mom has done what she could to make this terrible experience at least bearable for Dot. I think that just happens naturally with sisters, especially Mom and Dot. They think in similar ways. They relieve stress with a hose in hand. Their eyes both disappear when they laugh really hard. They hang their head the same way when they do dishes. They have smile lines in the same place. They are just cut from the same cloth. Mom and Dot at church on Sunday, watching Andy play. But Mom comes home today, two days shy of three weeks since she left. And Dot’s precious friends will fill in the gap beautifully. I know they are ready! These friends will remind Dot of her strength, and of all of God’s goodness that will come her way. They will exist with her and help her complete the tasks at hand. They will give her John hugs. They will stand in John’s shoes and finish the front yard landscaping. They will fill an hour here and there when loneliness hits. I have never been more grateful for tight, historical relationships with family and friends as has I have been this weekend–I have seen first hand, just how precious it is to have a sister and to have friends. God’s grace is evident through both. 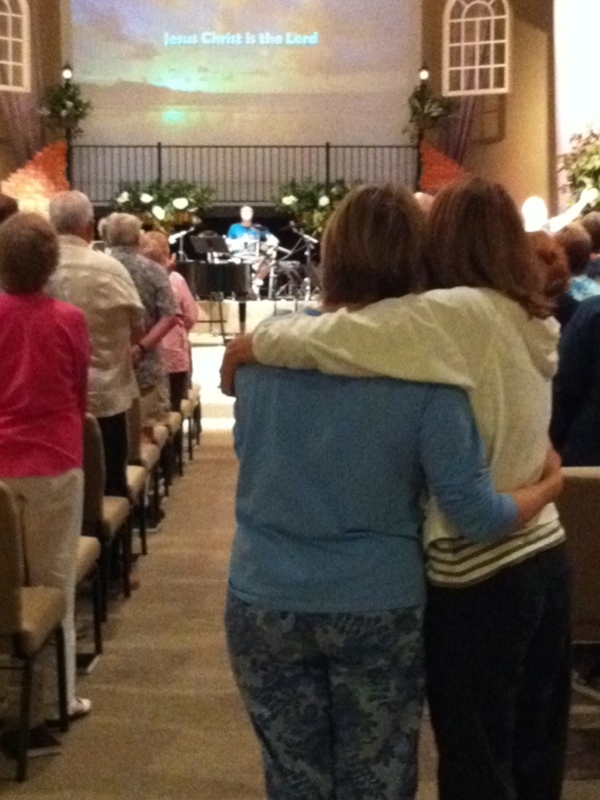 The song “I can only Imagine” come to heart… We will all be ready to hold their hands and are thanking God for the words of comfort shared and those to be shared! This post warms my heart thinking about the future my three girls have as sisters. Thankful that I can call you my friend, Chels! Thank you Chelsea for keeping this blog going. There are so many of us who want to roll our sleeves up and help Dorthy (however, i may start calling her Dot) with whatever she needs done to get ready for Andy’s wedding. And after that we will be there. Always. She is such a precious friend. It was so wonderful to see your beautiful family embrace each other and keep other strong on Saturday. I know John was smiling down on all of you. It was a lovely memorial service. Chelsea, This post still makes me cry. Maimie, having 6 brothers and no sisters has always made us appreciate having a sister. Being with Dot over these weeks has been an unreal experience for so many reasons. One reason being we have not spent 3 weeks together since I left home in 1972 after marrying and moving to Texas. My heart is still there on Winding Way with Dot and all. Today, it is Friday and after being there I know the anticipation everyone has for Andy’s return every Fri night. Last night he could not stay away another night and he brightened everyone by coming home for a short time to see all the progress in the top of the property. He turned around and drove back to the bay area for one more day of work. Being together is the tonic for some things. Just being together for the extended time was a kind of order in the chaos. We put our shoulders together and begin to tackle stuff. Being together brings a little sunshine into the fog of sadness. I love the way you and Meg come together to do hard things. Dot and I can’t take criedit for what you all have, but I am deeply grateful for the way God let’s us be a witness. That is our gift– to see you two have what we have had and cherished and now cherish even more. Dot, I am ready to be there again to put our shoulders together. We are greatful for a party to host and for the host of angels who have created a beautiful setting made with gifts of love. Our hearts are overflowing with gratefulness. We’ll miss those hugs so tight they take your breath away, but there will be lots of love to go around. I love you dear sister.